We are a science-art outreach project that translates the rhythms and harmonies of the cosmos into music and sound. 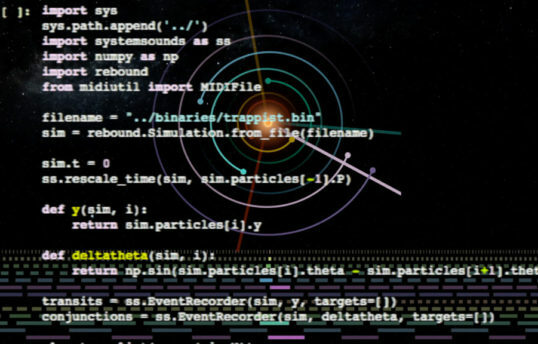 Our first creation TRAPPIST Sounds was featured in the New York Times and we are now collaborating with NASA to make astronomy more accessible to the visually impaired. Visit our ABOUT US page to learn more. It’s been a busy spring! 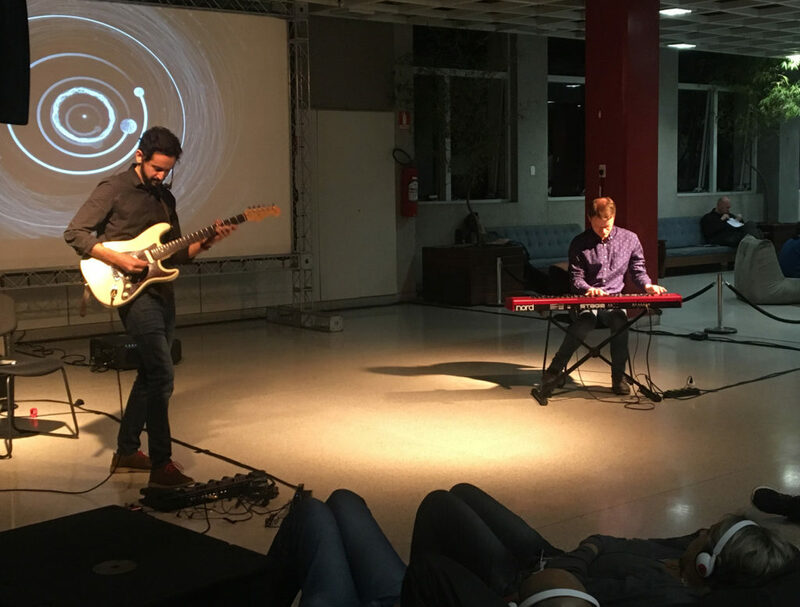 We travelled to Sao Paulo, Brazil to speak and perform at the annual SESC’s FestA! 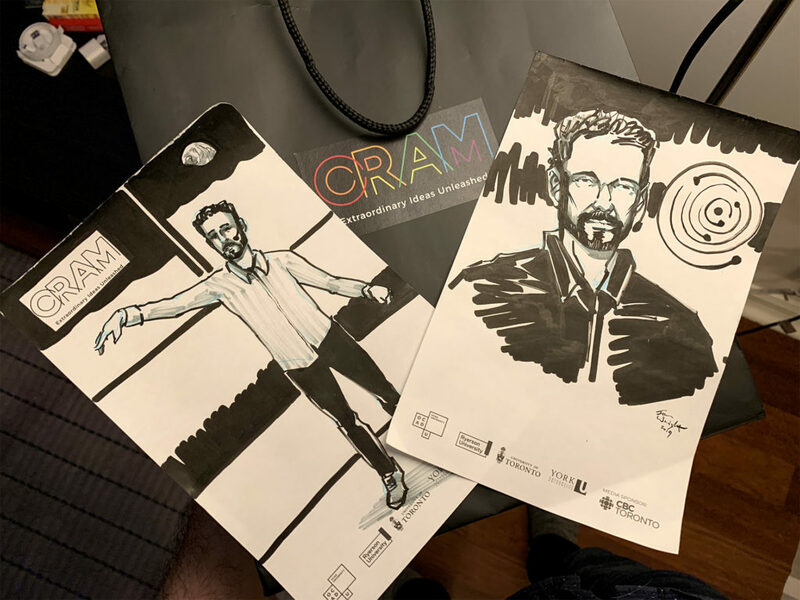 and Matt presented at the inaugural CRAM festival at the University of Toronto. We’ve got several big projects planned for the summer and some exciting news to share soon, stay tuned! We worked with NASA to convert a stunning image of a massive galaxy cluster into sound. Time flows from left to right and the frequency of sound changes from bottom to top. Listen to hundreds of compact elliptical galaxies, many elongated spiral galaxies, and a few foreground stars. 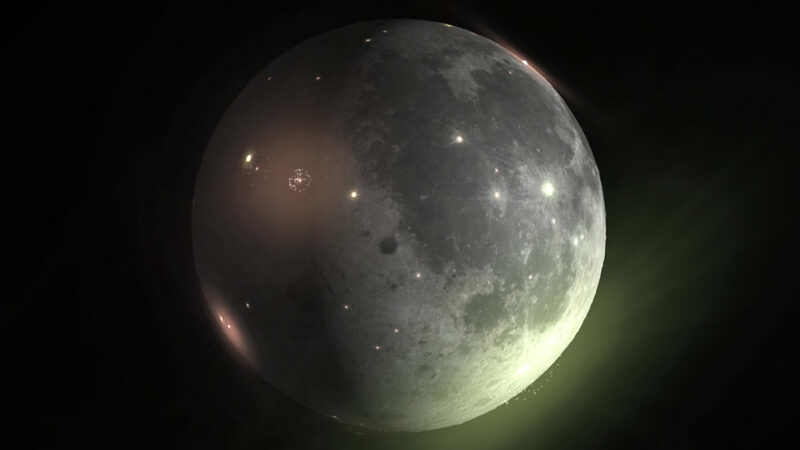 New research has been able to date the larger craters on the Moon and found that the Moon was pelted more often by asteroids starting about 290 million years ago. 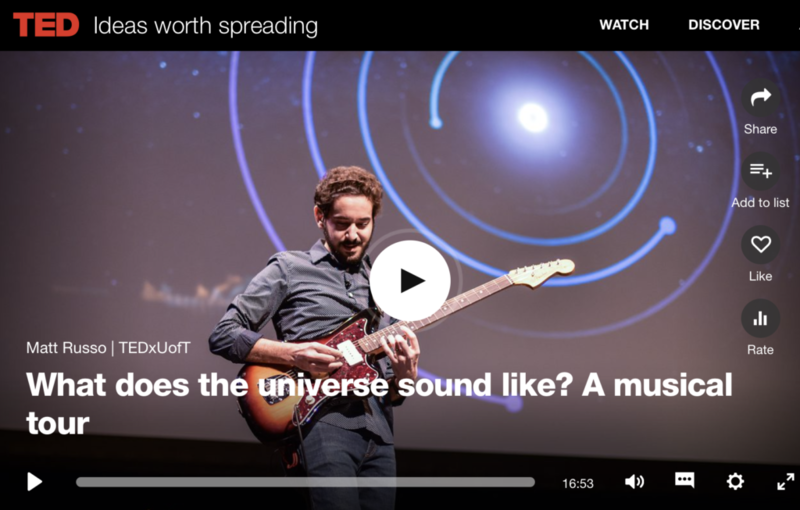 Listen to all 111 of these impacts as music, 1 billion years in 1 minute, or to the Moon’s surface elevation converted to a sound wave. Click here for more info! 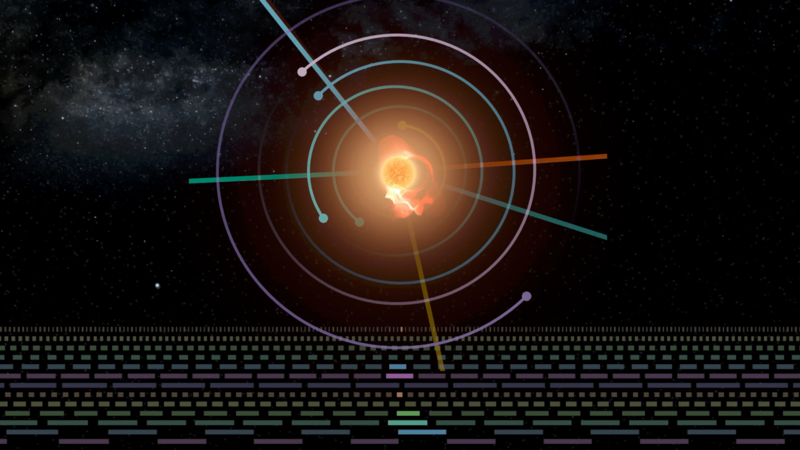 A 6th planet was just discovered orbiting in the supremely musical K2-138 system! 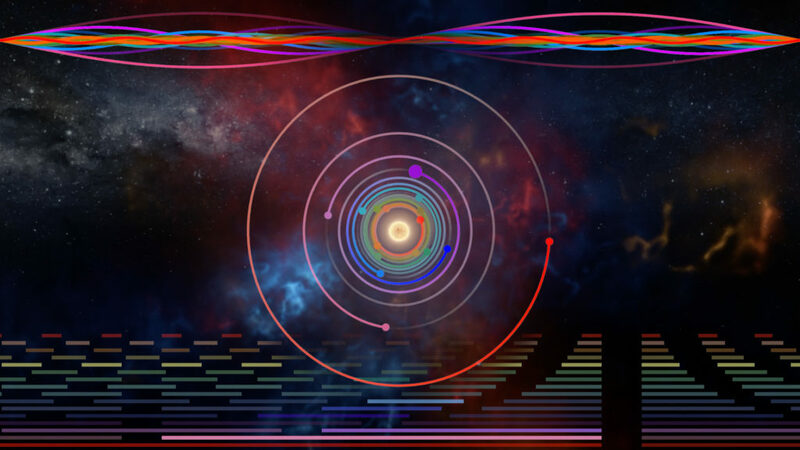 Listen to the planets’ heavenly harmony as their orbits slowly relax from their initial tuning. 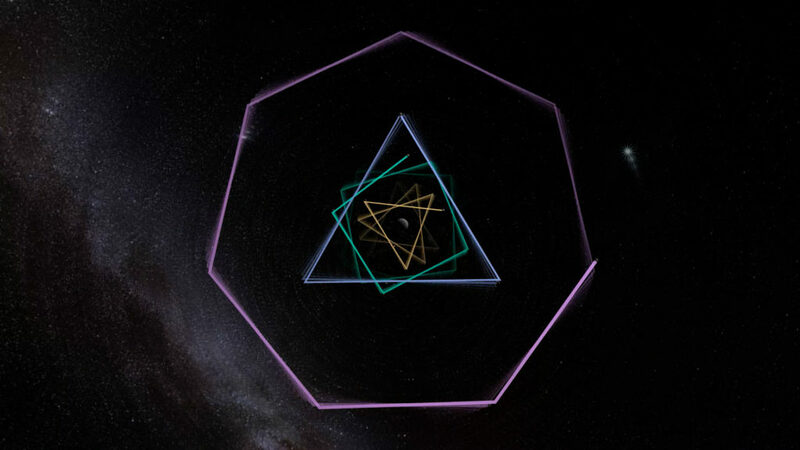 Click here to learn about how this system plays the music of the father of the Music of the Spheres, Pythagoras himself. A new batch of 100 newly confirmed exponents were just announced and we worked with the paper’s author to hear the mysterious music of the most interesting new solar system: K2-187! Click here to listen to the system’s own natural harmony and to the data used to discover it! Matt’s talk has now reached over 1 million views on TED.com! Click here to watch it (again!) and to find links to his favourite articles, books, and online apps that explore the sounds of the universe. On September 29, 2018 we premiered our new planetarium show One Sky at Nuit Blanche Toronto. 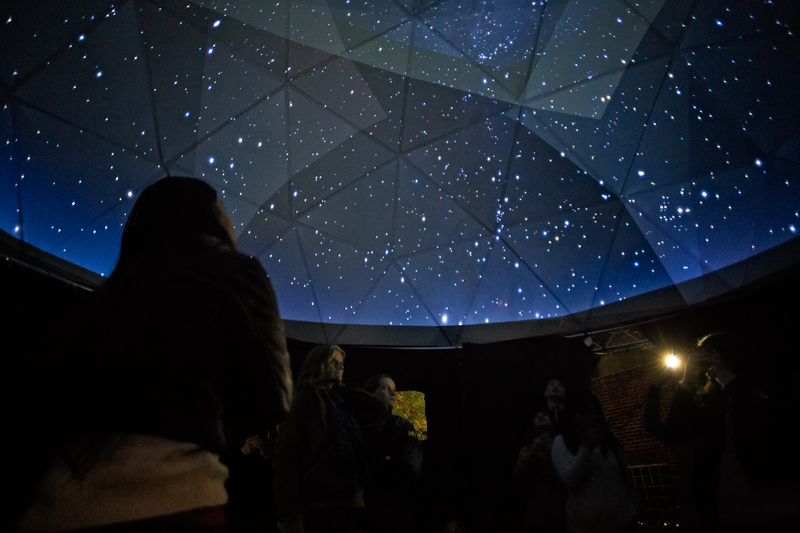 We partnered with the Dunlap Institute for Astronomy and Astrophysics to create a raised outdoor planetarium dome that let over 4500 people see the entire night sky projected above as thousands of visible stars were converted into music. Click here for more information and to bring One Sky to a planetarium near you! 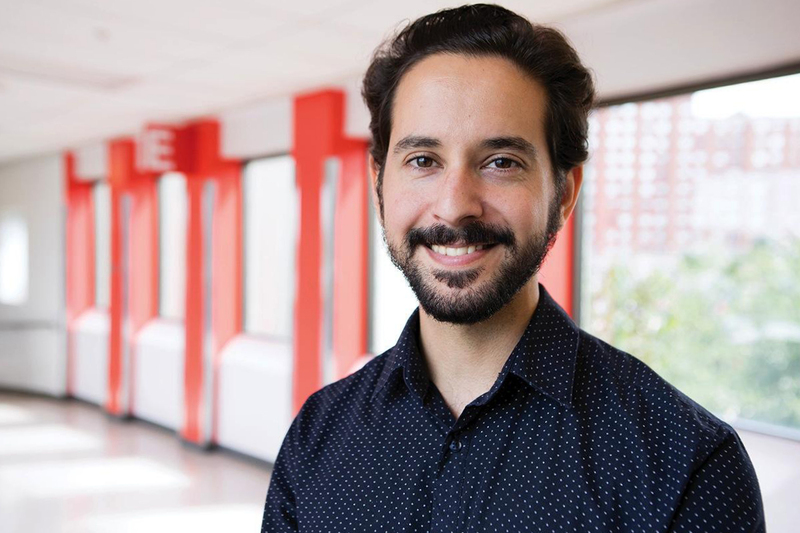 Matt was featured as part of the #ThisIsUofT series. Learn the story behind the space music and see some exclusive footage of RVNNERS workshopping songs for their upcoming EP! 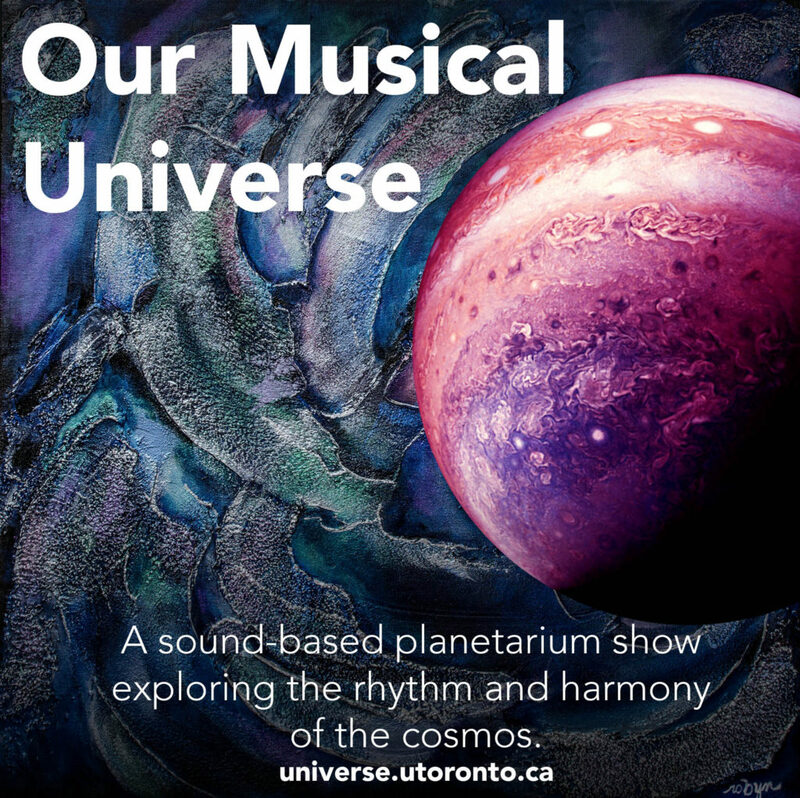 Matt has developed a new course at Seneca College called Music & Astronomy: Exploring Rhythm and Harmony in the Cosmos that gives students to the tools to create their own space music! For more information read the article in NOW Magazine and stay tuned for a public presentation of the students’ creations in December! Listen to the sound of the Black Widow Pulsar as it destroys its mate! 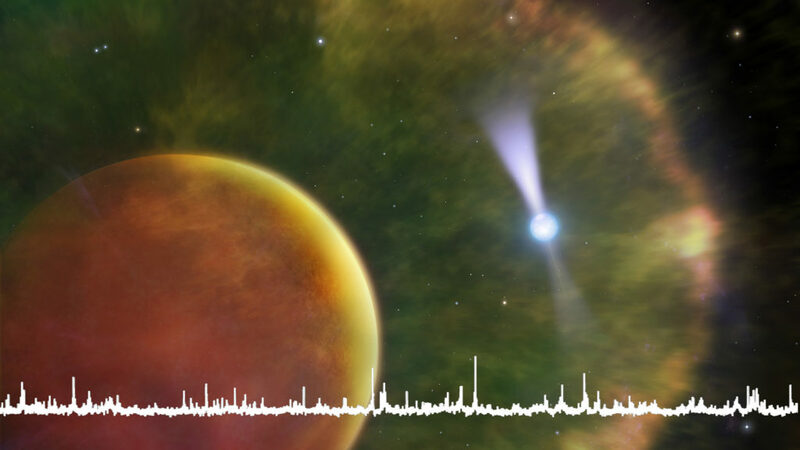 The pulsar’s 622Hz period produces an Eb note and the flickers are caused by the radio beam passing through the brown dwarf’s tail which acts like a magnifying glass. All sounds in these videos are created with data of the pulsar’s radio emission. In addition to the direct sonification of the radio waves, the percussion is triggered by the magnification events and all the pitched sounds are the pulsar’s (unmagnified) signal shifted to different notes. Is the unlucky brown dwarf trying to signal SOS? 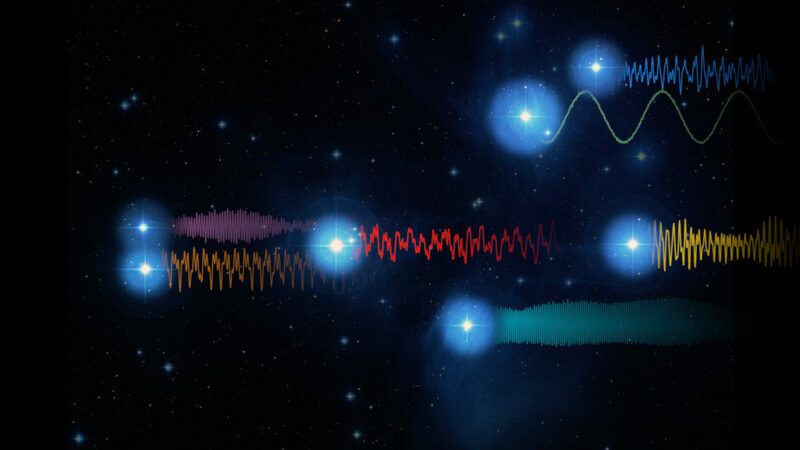 We recently worked with NASA to convert the gamma rays of a famous flaring blazar into sound. Higher energy rays are represented as higher pitched notes and visualized with larger circles. On July 12, 2018, astronomers announced the detection of a high-energy neutrino created by this blazar during the flaring event heard in the video. This is the first time we’ve been able to discover the source of high-energy neutrinos coming from outside our galaxy! 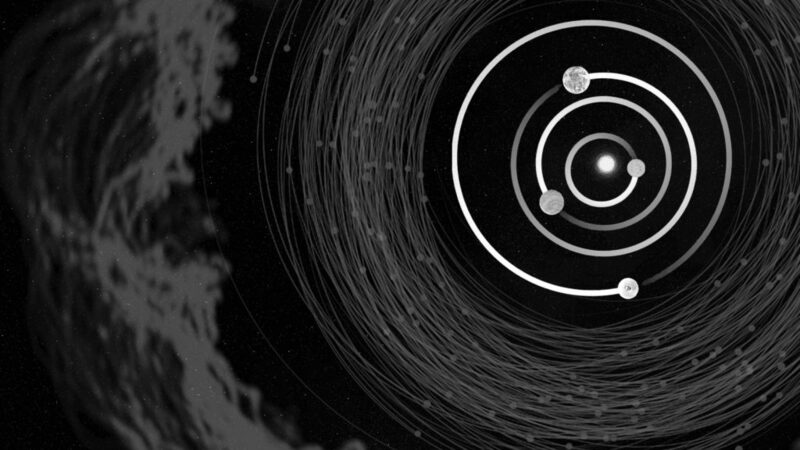 Watch Jupiter’s moons create mind-bending geometric patterns as their rhythms are sped up to become musical harmony! Click here for more info. 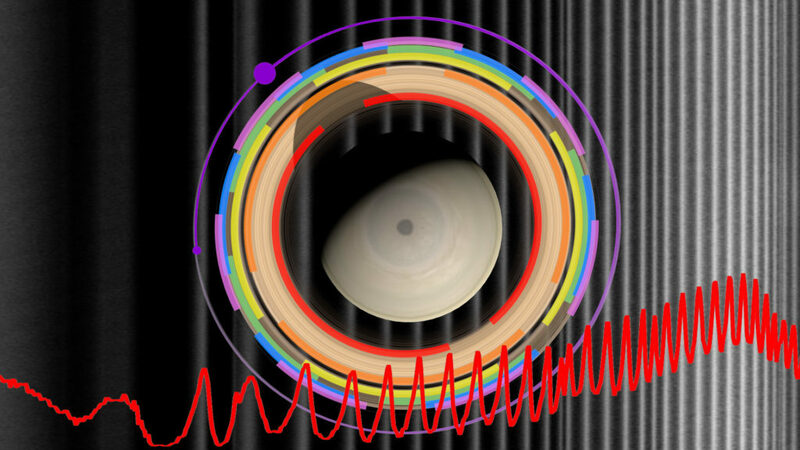 You can now use the Cassini spacecraft to strum Saturn’s rings like a harp! Each of the 2 million pixels of the highest resolution colour image ever taken of any part of the rings is converted to a note based on its brightness. Go on, help Cassini relive its final days with one last song. Click here to play/cry. This app was the Astronomy Picture of the Day for April 24, 2018! Sounds like our solar system is a big Radiohead fan! We’ve converted the motion of the terrestrial planets into music and it appears that they’re playing True Love Waits, Radiohead’s saddest song. The asteroid belt provides the required bass notes and vocals by Thom Gill complete this gloomy cosmic dance. Click here for more information. The HotPopRobot Maker Family and SYSTEM Sounds have converted the harmonic orbits of the TRAPPIST-1 planets into a cosmic pinball light show! This installation premiered at the Ontario Science Centre’s Tech Art Fair where it caught the eyes and ears of thousands of curious children. For the full story click here. We have developed a sound-based planetarium show Our Musical Universe which takes people on an audio and visual tour of the cosmos from the night sky all the way out to the edge of the observable universe. It is currently showing at the Dunlap Institute for Astronomy and Astrophysics’ planetarium at the University of Toronto. For tickets visit here. More dates will be added soon! The artwork features “Myth” by Robyn Rennie, who painted it after experiencing an advanced showing. One of the world’s most adventurous musicians plays, and plays with, one the galaxy’s most enchanting planetary systems. 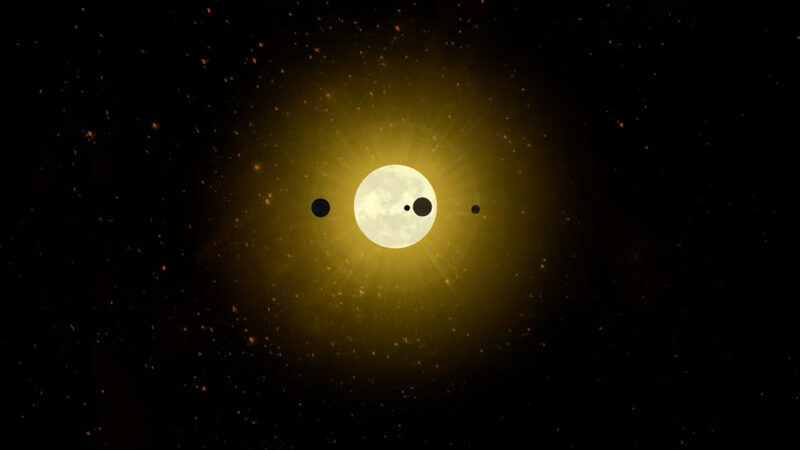 Dan Tepfer uses a Yamaha Disklavier in conjunction with his own looping software to record and play back the pitches and rhythms of the TRAPPIST-1 planets. These notes result from bringing the planets’ actual orbital frequencies into the human hearing range. Dan then uses this planetary harmony to launch into his own improvised exploration. Visit dantepfer.com for more. The most famous star cluster in the night sky has released its first hip hop track. Recent measurements of the brightness variations of the Pleiades have shown that these stars pulsate in complex and harmonic ways. We have converted their light curves into sound waves to create an interstellar loop. The ghostly sound that sweeps through is a sonification of the image of the Pleiades and its dramatic reflection nebula. Click here for more information. Want to learn more about the deep connection between music and astronomy and the stories behind some of our space music? Check out Matt’s talk at Hart House Orchestra’s performance of Holst’s The Planets or his longer talk at the Ontario Science Centre’s Saturn Star Party. For the latter, he’s joined by Andrew for a live performance of Saturn’s B Ring, for electric guitar and Rhodes. 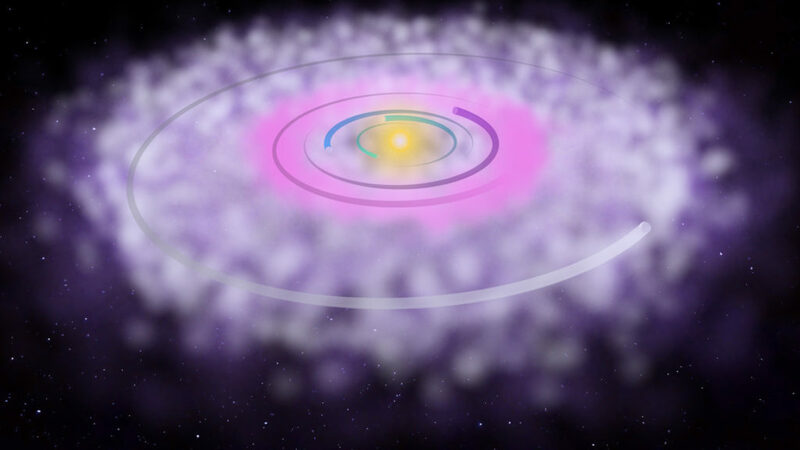 The harmonic series forms the basis of musical harmony and rhythm and now you can hear it played by a hypothetical planetary system! Click here for more! A new, fully narrated video that explains the marvellous music of TRAPPIST-1 and how it keeps the system from destroying itself. 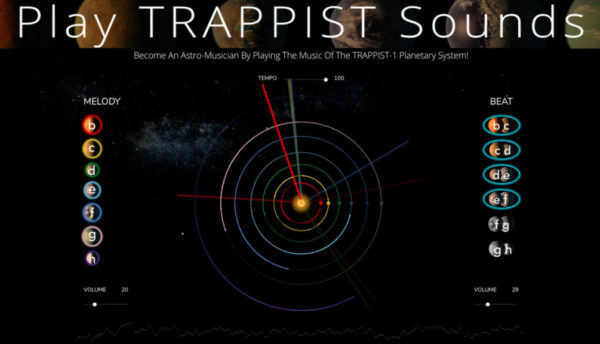 You can now play the music of the TRAPPIST-1 system any way you want by simply pressing buttons in our new web application. Click the image to begin creating your own space music and record a screen capture to share your work. We’d love to hear it! We have refactored our open-source code so that it is more easily extendable, and added several examples to work from. It is now easier to take new ideas and customize your sonifications/animations. We’re using the new code for some exciting projects, and would love to hear what you come up with! Click the image to access the code through via GitHub.